The last time I texted while driving was today. I don’t do it often, but I did it today. At a red light I did what I think most people do at red lights. I pulled out my phone and went on Facebook. While on Facebook I saw one of my friends selling a calf. I’ve wanted a cow ever since I was a little kid and I was ecstatic to see this. Normally at a red light when I pull out my phone as soon as the light turns green I shut my phone off and don’t touch it again. But, today was different. 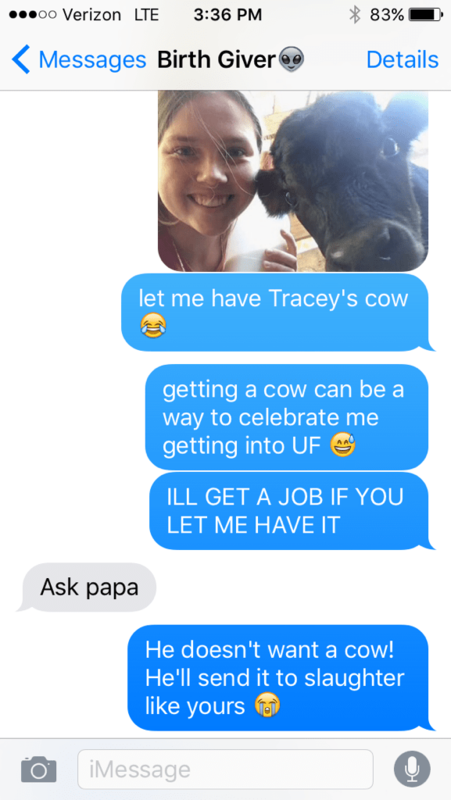 I was excited about the calf and wanted to show my mom. So I screenshotted the post and sent the text. I didn’t think she’d text me back right away, but she did. Normally, I don’t care if my phone goes off while I’m driving, but again, I was excited about that cow. I checked my phone and responded again. After this text I didn’t mess with my phone again until I was home, but that was already two times I had texted while driving. A lot could’ve happened during those few seconds I looked away from the road. Luckily, there was no traffic around me at this time where I was so I wouldn’t have injured anyone else, but I still could have swerved off the road and hit something and hurt myself or even killed myself. Most people don’t think about the consequences of their actions until the consequences occur. I wasn’t even thinking of anything bad happening as I was sending those few texts today. I don’t think most people expect anything bad to happen to them. People always think “Oh, well that won’t happen to me”. But, they’re wrong. Car accidents can and do happen to anyone and texting while driving increases your chances of being in an accident. You don’t want to be the person who injures yourself or another person. I normally do not text and drive. I think my main problem today (other than being excited about the possibility of getting the cow) is that I did something out of the ordinary. I put my phone on sound. Normally when driving my phone is on silent so I don’t hear or notice when someone texts me. If I can’t hear a text, then I don’t know about the text and therefore I don’t have any urge to reach for my phone. But, today the sound was left on and as soon as I heard it I reached for it because, again, a baby cow! But, had there have been an accident because of me texting and driving I wouldn’t have a baby cow. Sending a text about the baby cow could have waited until I got home. I mean, the baby cow surely wasn’t going anywhere. The text I sent was not worth the damage it could have caused. Absolutely no text is important enough to send while driving. If you desperately need to text, do the right thing, and get off the road.